Despite multiple reports that it would be a professional-grade version of the Canon EOS R (though make no mistake, a pro version is coming), the Canon EOS RP is instead a more populist version of the company’s full-frame mirrorless model. Indeed, the ‘P’ in the model name stands for ‘Popular’, in the Japanese sense meaning ‘for everybody’, which could make this the best Canon camera for enthusiasts and first time full frame camera buyers. Which tells you exactly who this camera is aiming for. The company has listened to consumer feedback and realised that there was a lot of interest in the EOS R from advanced amateur photographers – the kind who already own an APS-C camera (such as a Canon EOS 77D or Canon EOS M50) and want to take the leap into full-frame, but don’t need the specialist features and don’t want the bulk and weight. The EOS RP, therefore, sits adjacent to the Canon EOS 6D Mark II in the product line-up, just as the EOS R sits adjacent to the Canon EOS 5D Mark IV. And, like its bigger brother, the RP shares a great deal of architectural similarity with the 6D Mark II, from the sensor to the feature set. Yet it’s housed in a body that is Canon’s smallest and lightest ever full-frame camera. While the RP is powered by the new Digic 8 processor, its 26.2MP sensor is almost exactly the same as the one inside the 6D Mark II. It has been redesigned somewhat, to optimise it to work with a mirrorless system and to accommodate the difference in the flange back distance of the RF mount, but for all intents and purposes it’s the same sensor. Accordingly, the RP has the same ISO100-40,000 (expandable to 102,400), along with Dual Pixel CMOS AF. It will autofocus down to -5EV, and Canon makes the Familiar Manufacturer’s Claim™ that it possesses “the world's fastest AF speed” of 0.05 seconds. The AF coverage is 88% x 100% on the sensor, providing a mammoth 4,779 autofocus positions – which are split into 143 zones if you’re using the auto AF functionality. Servo AF now supports Face Tracking with Eye AF, which was a bit of a glaring omission on the EOS R, along with single point Spot AF, which is something else that has been transplanted from the 6D Mark II. It can shoot in 4K up to 25fps, but loses Dual Pixel CMOS AF and suffers about a 1.76x crop when doing so. In 1080p it can shoot up to 50fps, without a crop and with the benefit of Dual Pixel. The Canon EOS RP doesn’t have a lot of “killer app” features, since it was designed to be an entry level version of the EOS R. However, it does possess a few useful new tricks up its sleeve – such as Focus Bracketing, which is a useful macro feature found on other systems but one that Canon has never attempted before. It’s a semi-automated focus stacking mode where you tell the camera how many images you want to take, and it then captures each one while moving the focus point between shots. The result is a series of images that can be merged to extend depth of field, though unfortunately the RP doesn’t do this in-camera – you will need to download the new version of Digital Photo Professional or do it manually in something like Photoshop. The RP, like the EOS R, doesn’t have in-body image stabilisation. It does, however, employ Canon’s Dual Sensing IS technology when combined with RF lenses (such as the six new RF lenses that have just been announced). The system uses the gyroscope built into these lenses to detect lens movement, in conjunction with the CMOS sensor and the Digic 8 processor to detect subject movement. This data is fed back into the optical IS unit to instruct it to move correctly to eliminate as much movement as possible – particularly low frequency movement, which is notoriously difficult to correct (stabilisation typically ignores minor vibration, so that it isn’t confused with breathing or small panning adjustments). Canon says that Dual Sensing IS is good for five stops of stabilisation. Arguably the most impressive thing about the Canon EOS RP is its tiny form factor. Weighing just 485g including a battery and memory card, it’s 175g lighter than the EOS R and 280g lighter than the 6D Mark II. In fact, its closest comparison would be the Canon EOS 800D/Canon EOS Rebel T7i, which weighs exactly the same body only (but is 532g with battery and card) and measures 131.0 x 99.9 x 76.2mm – much chunkier than the RP’s streamlined 132.5 x 85 x 70mm frame. When paired with an appropriate lens, such as the Canon RF 35mm f/1.8 IS Macro STM or an EF 50mm f/1.8 STM with the EF-EOS R Mount Adapter, the camera feels almost as deft and manoeuvrable as a Fuji or Olympus system. However, this compactness advantage when paired with smaller lenses becomes a bit of a disadvantage when paired with larger lenses – something of a drawback, when the RF range consists mainly of monsters like the 950g Canon RF 50mm f/1.2L and the 1,430g 28-70mm f/2L. Like the EOS R, there is a bit of a disconnect between the smaller consumer-grade body and the much larger pro-grade lenses that truly dwarf the EOS RP. Even the Canon RF 24-105mm f/4L that’s available as a kit lens feels unwieldy at 700g. Which is probably why Canon is, cannily, offering a bundle with the EF 24-105mm f/3.5-5.6 IS STM instead, which actually feels a better fit for this camera. Still, the optional Extension Grip EG-E1 adds a discreet plate that offers slightly more finger space to balance larger lenses. The 0.39-inch, 2.36 million dot electronic viewfinder has been transplanted from the EOS M50 and works perfectly well, even though it’s a tad smaller than the EOS R’s. We’re supremely grateful that Canon opted to keep the fully articulating touchscreen, though, which again at three inches and a million dots isn’t as hi-tech as its big brother’s, but if anything actually feels a little more responsive. The fact that the R and RP are the only two full-frame mirrorless cameras with articulating screens is a big deal, especially for videographers. The EOS R’s Marmite-flavored embellishments, the M-Fn touchbar and the Mode button that was quite alien to Canon users, have both been dropped, along with the top LCD screen. Replacing them is Canon’s more traditional Mode dial, which takes up less space and makes the shooting process more intuitive, as you don’t have to stop and think every time you want to switch modes. Sadly, also dumped are the ‘blast door’ shutters from the EOS R that would shield the sensor when the camera is turned off, protecting it from debris while changing lenses. It’s an understandable cost and weight compromise, but we miss it nonetheless. While it’s tempting to draw comparisons against the likes of the Nikon Z6 or even the EOS R, it’s important to remember that the EOS RP isn’t really in the same bracket as those cameras. Accordingly, while its performance seems comparatively unspectacular in some respects, the RP performs quite well for a camera in its category – particularly when it comes to shooting stills. In terms of image quality, file fidelity and dynamic range, the photographs produced by the RP are excellent and handle very similarly to those of the 6D Mark II. There appears to be slightly more detail in the shadows, thanks to the Digic 8 processor giving it a bit more oomph, but you’re effectively looking at the same sort of levels between both cameras. The RP certainly isn’t going to win any awards for speed, with a burst mode of 4fps in Servo AF or 5fps in One Shot, and you can get about 50 14-bit raw files on a UHS-II card before the camera starts to slow down. Again, though, this isn’t a sports camera; it’s an everyday, for-everybody camera with a £1,399 price point. While the eye tracking with Servo AF is most welcome, in practice it wasn’t quite as useful as we were hoping. Certainly it’s outdone by the smarter tech that debuted in the Sony A6400, but in moment-to-moment shooting it often deferred to standard face tracking at anything other than relatively close quarters. The face tracking, though, works great, and does a very good job of following a face in the frame. However, it gets understandably confused when there’s more than one person in shot; when we took the RP out for an afternoon at Camden Market, the tracking could be a bit overzealous and started jumping from our subject to the faces of passers-by in the background. Fuji has addressed this issue with the Face Detect feature in the Fujifilm X-T30, which enables you to select which face in a scene you wish to track. Admittedly the instances in which this became an issue were relatively few and far between… though we’d probably be a bit more upset if we’d focused on somebody else’s kid crossing the finish line at school sports day, rather than just getting a pedestrian in focus instead of the street performer we were trying to shoot in Camden. Autofocus in general works like a charm, though, especially in low-light conditions. The EOS R is a fierce performer in this regard, and the RP is right there with it. We shot indoors in some very dim environments, as well as during the twilight hours after the sun had disappeared, and the focusing never once let us down – it’s fast, accurate and very dependable. A somewhat peculiar choice is the decision to move the silent shutter from a menu option to a dedicated Scene mode. Certainly for the consumer the RP is aimed at – a more casual photographer, graduating from a less advanced system – the automatic modes such as Night Portrait, Close-up and Sports are valuable ways to make sure that less experienced shooters can get reliably good low light, macro and action shots. However, making the silent shutter such a mode means that you have no manual control when shooting. We’re sure that families wanting to take unobtrusive photos at weddings or gatherings will be grateful to have an easy, fire-and-forget mode that they can turn on, but this was the first and only time that the RP felt like it wasn’t suitable for more advanced use. Since the ability to shoot silently is one of the USPs of a mirrorless system, retaining the silent shutter option in the menus for manual shooting would have been welcome. While stills shooting is otherwise fantastic, as noted the 4K video is where the RP bears the brunt of the performance compromise. Suffering the 1.76x crop and being limited to 25fps is one thing, but losing the Dual Pixel CMOS AF really is a tough nut to swallow. On top of that, 4K suffers from the dreaded “jelly wobble” rolling shutter effect, making it largely unsuitable for anything where panning or movement is involved. That said, you have the ability to use Focus Peaking in manual focus mode, which is a welcome feature for “proper” videographers who wouldn’t use AF anyway, Dual Pixel or otherwise. Still, 1080p shooting is a much better option for most purposes – it would have been nice to have C-Log and a 120fps option, but the ability to shoot without the crop and with Dual Pixel means this is probably the way to go for most video needs. The battery life was initially a concern, being CIPA rated at just 250 shots. In practice, however, you can achieve much more than that – almost double, if you’re considered in how much you use the LCD screen and if you’re conscious about turning the camera off rather than letting it idle between shots (remember, leaving the EVF on is like leaving a little TV on inside your camera, so it will guzzle the power). Obviously shooting video, and especially 4K, will deplete the battery in double time, so this will be more of an issue if you’re doing multiple takes or constantly chasing B-roll. However, being able to plug in a USB power pack on the go means that you can easily top up the juice – though you can’t charge and shoot at the same time. For comparative testing, we pitted the Canon EOS R against the Canon EOS 6D Mark II, the Sony A7II (being its closest Sony rival in terms of specs and price), and the Canon EOS M50 (an APS-C camera, but worth considering for those primarily concerned with the size and weight advantages that the RP is selling itself on). 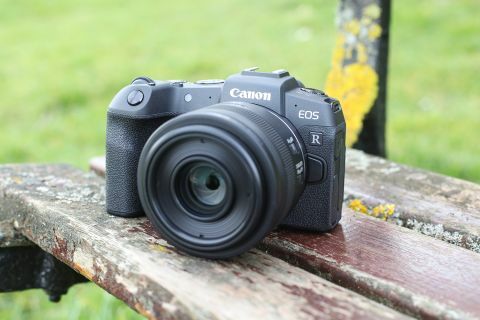 Indeed, with so many people questioning whether the RP will spell the end for the smaller mirrorless line – though Canon insisted to us that the M series is here to stay – the M50 is quite an important comparison. The EOS RP and its rivals are closely matched in this test, which measures image noise levels at each main sensor sensitivity. As you'd expect from sharing similar sensor tech, the RP and 6D Mark II produce especially close results, with the Sony A7II joining them up to ISO6400, though its high ISO image clarity is weak above this sensitivity. The APS-C M50 does well to stay close to the full-frame cameras, as its smaller sensor photosites have the potential to generate significantly more noise, especially at higher sensitivities. Unsurprisingly the identical sensor resolution of the EOS RP and EOS 6D II means that they resolve very similar detail levels. The 24.3MP A7II does well to maintain an equivalent level of detail to its 26.2MP rivals, though Canon hasn't been able to pull off the same trick with the 24.1MP EOS M50, as its smaller APS-C sensor produces slightly more noise at higher ISO settings and this compromises fine detail. Despite its age, the Sony A7II still produces formidable dynamic range at lower sensitivities, although things tail off quickly past ISO 6400. The three Canons are closely matched, and the full-frame siblings keep close family ties throughout the sensitivity scale. The APS-C M50 can't hang with its bigger brothers past ISO 800, however. Invariably there will be disappointment from users who were expecting (read: dearly hoping) that this would be a professional version of the EOS R to rival the EOS-1D X or 5DS/R. It’s unfair to judge the Canon EOS RP for what it isn’t, though. This is a remarkable feat of engineering, effectively cramming the power and performance of a 765g 6D Mark II into such a tiny 485g body while also adding 4K video and mirrorless benefits such as an EVF. A capable full-frame mirrorless camera for £1,399 is hugely appealing for anyone looking to upgrade to a larger sensor, especially one that retains the size and weight advantages of the APS-C bodies they’re already using. Indeed, the EOS RP’s compactness might even make it more appealing than the EOS R for photographers who need to stay light and nimble, such as travel or street shooters. Ultimately, the RP offers a shooting experience that feels familiar and intuitive for Canon users – and with the Mount Adapter EF-EOS R bundled in the box, existing lenses can be used right away. Indeed, the RP arguably pairs better with EF-S lenses and the lighter EF glass than it does with the bulkier RF optics. This really is a suped-up 6D Mark II in a smaller body with an EVF and 4K – even though 4K does come with concessions, making 1080p a better option for more serious video shooters. A highly capable stills camera, which produces images that stand shoulder-to-shoulder with any body in Canon’s line-up, those looking to graduate to full-frame photography would do well to consider the Canon EOS RP.